For decades, Shah Gilani has been pulling the levers of power at some of the world’s top financial institutions. But for the past 12 years, he’s been leveraging his Wall Street connections to compile some of the most sensitive data in the world – the kind of numbers that would send the world’s top CEOs into an immediate state of panic. Shah says it’s “proof of the greedy dealings, bumbling mismanagement and blatant stupidity” of the world’s worst companies. He calls it his Bankruptcy Almanac. And it’s nothing short of amazing. Not only does it show him which companies could be going out of business, it shows him precisely when it may happen, right down to the month. And here’s the important part – based on extensive testing – It has never been wrong. Last year, 22 companies from the oil and gas sector were listed in the Almanac. And just as it predicted, all 22 companies went bankrupt within 12 to 18 months. In Zenith Trading Circle, Shah will use his Bankruptcy Almanac to identify those companies that have been scheduled for potential termination, and show his readers how to target these companies over and over again for huge gains. 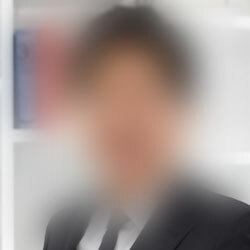 He’ll also share the methodology behind his controversial book – how it finds dying companies well before Wall Street catches wind of their impending demise. In his service, Zenith Trading Circle, he helps you put that secret to work. 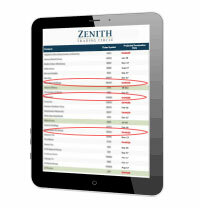 If you’re a Zenith Trading Circle subscriber, click here to login. If not, see below for more information about Zenith Trading Circle. Since April 21, I’ve shown my readers – and only my readers – an ASTRONOMICAL 44% gains per day, on average. 88% every two days… 132% every three days… 176% every four days… and 220% gains every five days. It’s like taking $5,000 and growing it to $25,000 every single month. And it’s all happening right now. It is, by far, the greatest accomplish of my career. And this is only a taste of what’s to come. 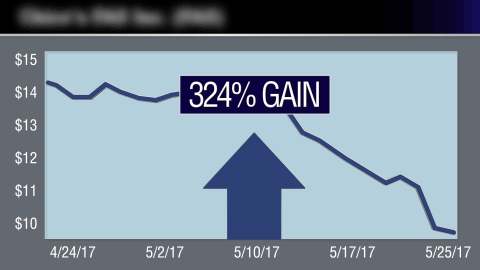 You’ll notice that since April 21, these daily gains have been getting bigger and bigger and bigger. They’re accelerating at a rate I’ve never seen. At this rate I may reach 80%, 90%, maybe even 100% gains per day within the next few weeks – profits that are beyond insane. But there’s a reason this is happening. Right now, in the market, we have a perfect storm event. Because it doesn’t benefit them… it does the exact opposite. That’s how I’m able to show my readers 44% GAINS PER DAY, on average, right now. However, know this: If you’re conventional in your thinking, what I’m doing isn’t for you. This is only for people who can think for themselves and take decisive action with extreme confidence. You’re NOT making 44% gains per day. No one is… except those who wake up first thing in the morning… open their email… and follow my instructions to a T.
Even the hedge fund guys, in their three-piece suits or tennis whites, are scratching their heads in disbelief. They can’t even come close to 44% PER DAY. And my readers don’t pay anywhere near $500,000 to get in on my trades, like these hedge fund guys charge. You could be cheating yourself out of tens of thousands of dollars in extra cash every week… money you could be using to make yourself obscenely rich. None of it will matter to you. Right now, at this very moment, I’m showing people how to grow their wealth by 44% PER DAY. And this trend is moving at warp speed. It involves an obscure type of trade that too few people know how to do correctly. A carbon trade allows you to repeatedly extract thousands of dollars from a single company – OVER AND OVER AGAIN – like a carbon copy. And this can often extend years into the future. A stock MUST drop by the amount you expect it to. If it does, you win. If it doesn’t, you lose. 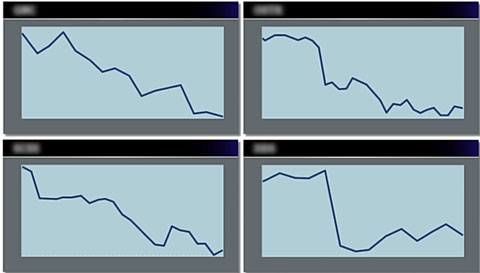 If you’re too afraid to go after these kinds of stocks, this isn’t for you. Targeting the WORST stocks in America is the greatest way to get rich. 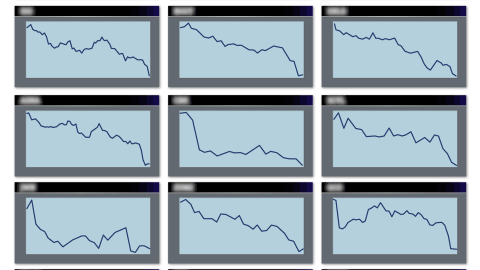 I’m using them on stocks that I know – based on 12 years of historical data – have about a 100% chance of dropping in price from now until the end of time. And that’s exactly what I’ve been delivering. As of June 1, all of them (but two) are up by double digits. SIX are now triple-digit windfalls. This is a copy of my track record. I have nothing to hide. 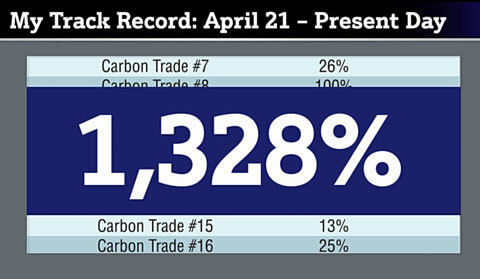 Altogether, my carbon trade recommendations have generated 1,328% total gains in 30 trading days. But I believe things are only just beginning to heat up. You can see that the rate of progression here is absolutely extraordinary… it’s unparalleled. And that means there’s almost no end to the carbon trades we can execute. Remember, as long as a stock is going down – and there are always HUNDREDS of those – you can make a killing over and over again. It wouldn’t be unlikely to end up millions of dollars richer. You can use a carbon trade to make monstrous 500%, 1,000%, even up to 5,000% gains – over and over again, within the span of a few months. Plus I rarely ever lose. The rest are all winners. That’s a 95% win rate. Before Dex Media filed for bankruptcy, for example, I would have been able to show you how to use carbon trades to make a ridiculous 7,979% on your money. 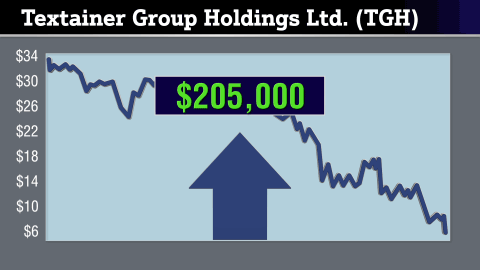 That would’ve transformed a few relatively modest $2,500 investments into $206,000. 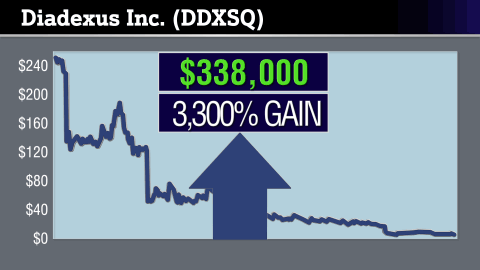 When Fibrocell Science’s stock crashed from $60 to $1, a few carbon trades could have made you 10,800% gains. In other words, your $2,500 stakes would’ve paid you $282,000. And when Oxis International saw its stock plummet from $192 to 24 cents a share, you could have used carbon trades to turn that drop into a colossal 21,000% score. To pocket $549,000, all you would’ve needed to invest was a few $2,500 stakes, without ever risking the profits you’ve already put in your pocket. For each of these stocks, you’d have potentially seen a double-digit return on your money every single day. The harder a stock falls, the bigger your reward could be. And that reward can go on forever. In 2014, I used carbon trades to show my readers 1,715% total gains on our top recommendations in under 30 days… which translates to around 57% gains per day. 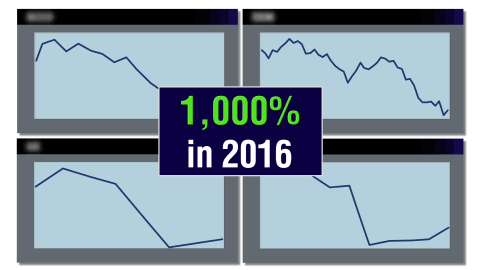 And in 2016, my carbon trades produced over 1,000% total winning gains on our best plays in a few months. I didn’t jump on the bandwagon and buy whatever stocks the media was spoon-feeding the public at the time. And then I used carbon trades to show my readers double-digit returns every day as these shares fell into oblivion. Is there a chance that the stocks I target don’t drop as I expect them to? But I say the odds of that happening are slim to none. But they also happen to be the EASIEST companies to get rich from. 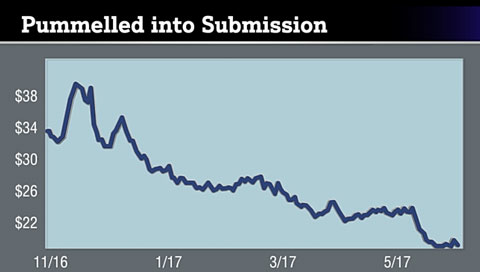 We are looking at one of the biggest market anomalies to have ever occurred. Most of which are garbage anyway, and shouldn’t even be trading. But they are… sucking up investors’ money every single day. But have you ever thought about how to take advantage of that FACT? The fact that while maybe 100 companies go up… another few THOUSAND go down? The elitists are too busy pumping up these stocks for their own gain. I know because I pulled the levers of power at some of the world’s top financial institutions. I even ran hedge funds that counted A-list celebrities and Wall Street elites as clients. 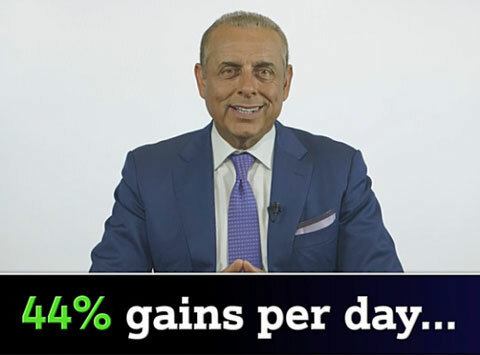 I’m helping everyday Americans make 44% GAINS PER DAY. And those companies are overpriced and overtraded. The market is literally shrinking into oblivion. In 2000, there were around 14,000 stocks on the market. Today, there are roughly 8,800. 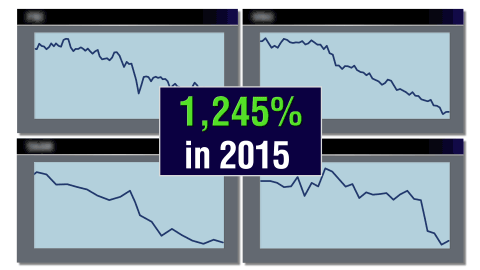 Last year, 2,760 stocks fell off the map. 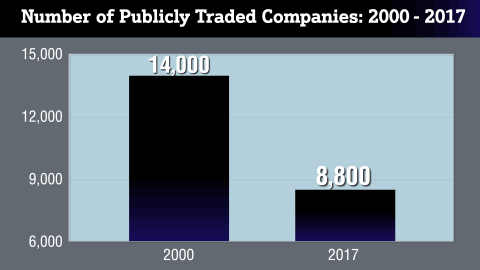 And how many companies do you think are going public every year? The answer is… a pathetic 128. That’s 65% fewer IPOs than we had in 2014. But again, the entire market is being pushed up by maybe 100 stocks… and those stocks are getting more expensive by the day. Some are trading for over $500 a share. And get rich from the THOUSANDS of stocks that will soon perish from existence. 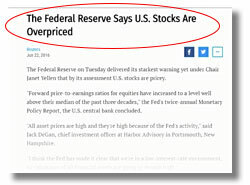 The Fed itself has been WARNING investors for years that stocks are ridiculously overpriced. And I’m making a killing on this sector right now. And there’s nothing anyone can do to reverse their fate. In May, investors wiped $4.6 billion from this sector alone in just two days… making this the biggest two-day wipeout in dollar terms since the 2008 financial crash. If this isn’t a sign of the destruction to come, nothing is. 90% of the companies in this sector DESERVE TO FAIL. And their CEOs are bloated, greedy, and deceitful. One of them is a multibillionaire who pays his employees as little as $4 an hour… and has been sued more than 50 times in the last 30 years for copyright infringement. It makes me happier than a pig in you-know-what. Another CEO, who also happens to be a billionaire, has become notorious for 45-minute shouting rants against his employees and firing people for speaking to the media. For being a complete numbskull and burying his stock – which, by the way, has been falling off the face of the Earth. In just the last month, it’s gone down an embarrassing 30%. If that isn’t a catastrophe, I don’t know what is. The answer is HECK NO. I FEEL LIKE A SAVIOR. 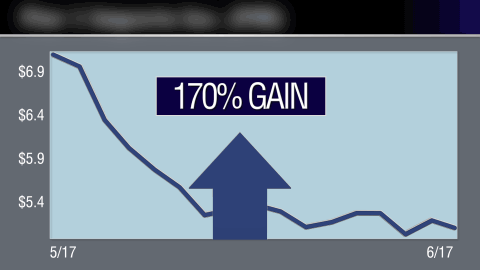 But I’m saving investors from buying shares in these horrible stocks in the first place… and instead helping them grow their wealth with 44% GAINS PER DAY. It’s vengeance at its finest. One of them forces its employees to buy its overpriced products on a near-daily basis. Its CEO also believes in only hiring attractive people. Does that sound like an “ethical” business to you?! And you would have never risked more than $2,500 at any one time. Another vile company trading in this rotten sector has been accused by its customers of questionable advertising and horrendous customer service. That’s probably why their stock looks like a broken Slinky that’s been tossed from the top of a garbage chute. 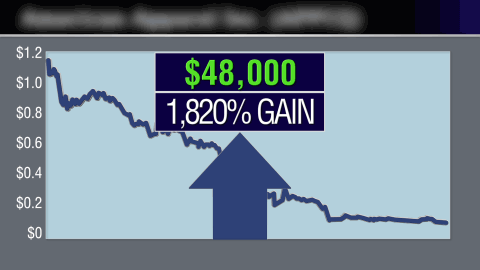 One where you could have made nearly 2,400% gains. 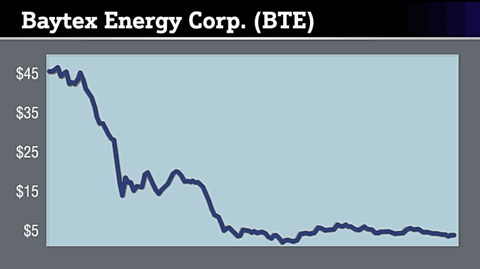 With a few carbon trades, I could have just helped you make $62,000 as this company’s shares were turned to ash. And again, you would have never had to risk more than $2,500 at any one time. And here’s another company in this sector that’s not only been accused of stealing designs… but also profiting at the expense of mental health sufferers. And would you believe it… this company is based in AMERICA! So watching their stock get pummeled into submission has been nothing but a blissful experience for yours truly. With one carbon trade, I could have recently shown you how to make $40,000 in a matter of months. 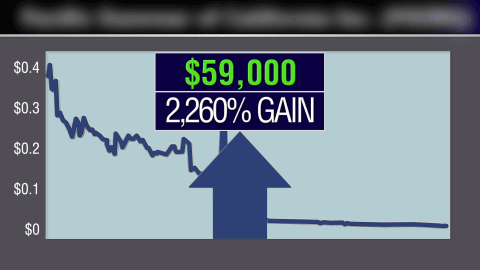 That’s $40,000 using one carbon trade on one stock and only having to risk $2,500. All by using carbon trades. To the infirmary – that’s where. A month later, I showed my readers a fat 324% return. This time on a company that has watched its income tank by 76% in the last four quarters. All of them are ripe for the taking. But that’s why using carbon trades on them right now is the EASIEST, SMARTEST, and FASTEST way to make money you’ll ever see. Another company is biting the bullet every few days. I literally can’t keep up with the body count. And making my readers 44% gains PER DAY. But we’re only just getting started. I’ve already lined up SEVEN new carbon trade recommendations that I’m predicting could easily crush the 44% per day benchmark that I’ve already set. This is NOT about shorting. But you’ll never make more than 100% on your money. I don’t know about you, but 100% doesn’t cut it for me. That’s why I only use carbon trades. With a carbon trade, your upside is potentially LIMITLESS and your downside is completely capped. 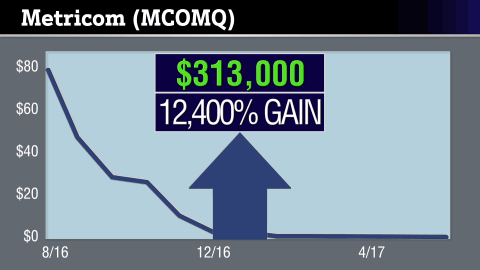 With just four carbon trades, this pathetic company would have made you about 3,300% total gains – or $338,000 in profit – and you would have never had to risk more than $2,500 at any one time. You could NEVER make this kind of money buying stocks… unless you dump your entire net worth into some rinky-dink penny stock and, by some miracle, it becomes the next Google. 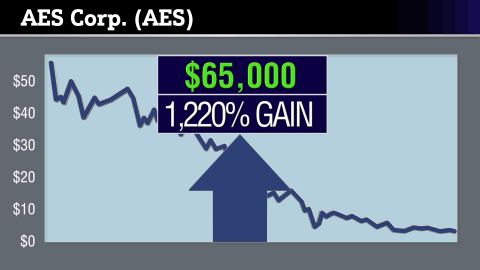 With AES Corp., I would have been able to show you five carbon trades that could have made you 1,220% total gains… or about $65,000 in profit. And with Textainer Group, I would have been able to help you make over $205,000… without ever risking more than $2,500 at a time. That’s $608,000 in total profit on just three stocks. I’m looking at more than 40 opportunities right now that are poised to hand you a total of $1.6 million in profit. But I want to make sure you understanding something. And are ready to take decisive action with extreme confidence. A carbon trade is anything but a “normal” investment. They are for people who crave wealth… have self-control… and aren’t afraid to take bold steps. If that’s not you, I can’t help you. For the next year and a half… enough time to give you the opportunity to make millions during this unique anomaly in the markets. And making you a ton of money. Look at this chart. It looks like its dropping down a 2,000-foot, solid ice crevasse on K2. On March 7, 2017, the company filed for Chapter 11. Knowing this in advance would have given me the chance to show you how to make 3,140% gains as its shares were incinerated. 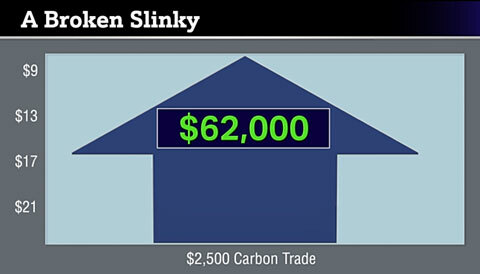 With a few $2,500 carbon trades, you’d now be $81,000 richer. Again, never risking more than $2,500 at a time. It looks like a skydiver who jumped off the Bay Bridge without a parachute. But once again, I would have known – nine months ago – that this company was doomed. 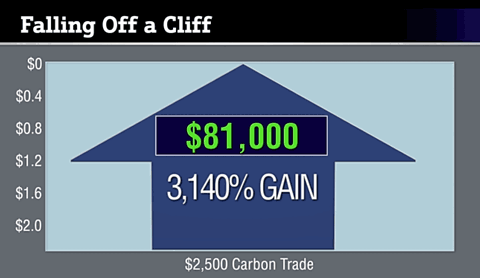 With two carbon trades, I could have made you 3,540% gains as a result, or $91,000 in cash, without ever risking more than a small amount of money. 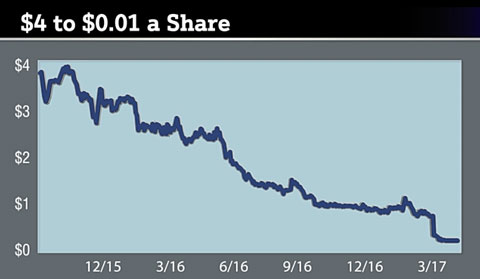 And here’s another stock that has plummeted from $4 to $0.01 a share. I feel bad for anyone who got suckered into buying this dreadful company. But with a single carbon trade you could have made $45,000 in cash as its shares were rightfully obliterated. Because with these companies, there is no guesswork. Do you remember a service called Ricochet? This wireless service was one of the biggest flops in history. 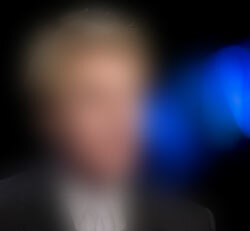 It was created by a $2 billion company called Metricom (MCOM). Within six months, they filed Chapter 11 and shut down. But with a few carbon trades, I would have helped you make over 12,400%… enough to transform a few $2,500 stakes into exactly $313,000. And gains this enormous don’t come around often. Because they know they have enough money that very little of anything else will ever affect them. Not taxes, not health insurance, not government, not anybody. But in the end, you won’t CARE. Even if you paid a hundred thousand dollars more in taxes next year, it wouldn’t be relevant. You’d still be laughing all the way to the bank. And I’m the one person who can identify which stocks have about a 100% chance of dropping to the ground. Within four months, shares plunged from $42 to $12 a share. By 2016, it was hovering at a piddly $2 a share. I’m sure its stakeholders wanted to tar and feather the boneheads who practically lit the company – and their money – on fire. For me, the demise of Baytex would have been like stealing candy from a baby. In fact, with a few carbon trades you could have made 6,100% total gains… enough to turn a few $2,500 stakes into over $155,000. In 2013, this 3D printer manufacturer hit the market with a loud bang. It quickly climbed to nearly $70 a share. This entire company was driven, frankly, by fake news. They were a total joke. At the time, their $4.73 million in revenue was driven by the sale of just three units of its million-dollar 3D printing machines. And this isn’t the worst of it. These three sales were paid for with loans. The company’s stock was trading at 66 times earnings. 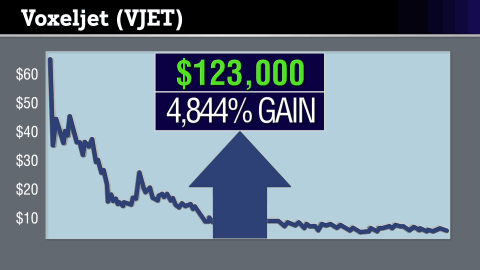 Compared to its competitors, this put VJET’s stock in the “utter rip-off” category. A sad and pathetic 92% drop in price. 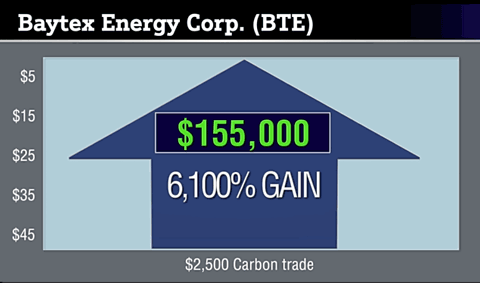 However, by using carbon trades, you could have made 4,844% gains in 11 months, turning $2,500 into over $123,000. I’m not telling you any of this to brag. I’m telling you ALL this for one reason. Wall Street elites love to inject these stocks into your bloodstream like a drug. All the while making my readers insane amounts of money. And 2,057 have NEGATIVE ROI – return on investment. How long do you think these companies have left before they keel over? Its stock is a DEAD weight. Its price is likely only going DOWN. 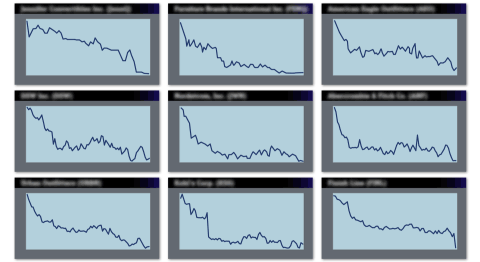 My technique for finding the worst stocks in America is foolproof. And the equation is even simpler. I start with their CASH position, which is always on LINE 1 of their balance sheet. Then I look at their short-term credit, which is a number that’s usually buried in the “liquidity and capital resource section” of a company’s 10-K report. I add these two numbers and – VOILÀ – I know how much money they have. Next, I look to see if the company is spending more cash than they have in their coffers. And from there subtract “CAPEX,” which is money the company uses to grow its business. This can include anything from repairing a roof to purchasing a piece of equipment or building a new factory. The last step is subtracting interest payments and dividends. The company is burning through cash just to stay alive. That is an instant RED FLAG. How long will it take before the company burns through every dollar it has? And then generate a schedule that shows me when all of the company’s outstanding notes and loans will mature by quarter. A single data point that is absolutely critical to determining when a company will go bust. It’s so good, in fact, that, based on 12 years of historical data, it has NEVER been wrong – ever. I have the backup to prove it. It’s all on paper – literally. I made one of the biggest predictions of my life. 45%, 50%, 55%, 66%, 74%, and 77%. But these aren’t normal companies. They are losing on every level. But this is a GOOD thing – it’s a blessing. And this has been happening while the market itself has gone up by around 11% this year. But these stocks are going down no matter what. Sure, this bull market is far from over. 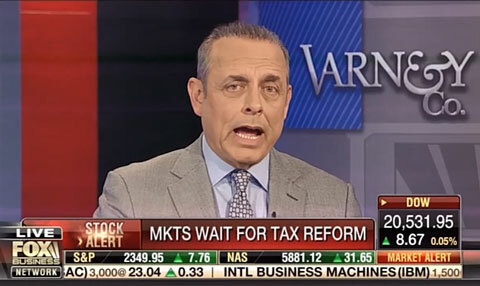 As a matter of fact, I just went on Fox Business News – like I do every Wednesday – and I said that the Dow is going to double in the next five years. The market is being driven by a few overpriced stocks. When you can profit from the HUNDREDS – even thousands – of companies that are ONLY going in one direction – and that’s DOWN? And this is in a raging bull market. These 44% DAILY gains could reach 90% per day. Could this percentage vary in the future? Absolutely. But, like I said, this fire has only just begun. Some of these botched stocks have already gone bankrupt. Others are at their tipping point. The news media will never tell you any of this. And that, my friends, will make me a VERY happy man. 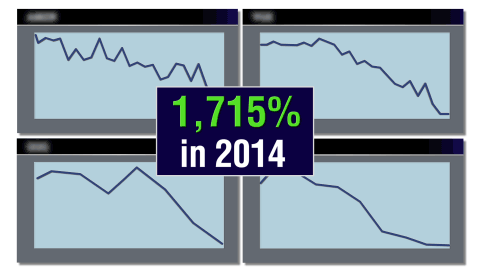 These companies are dropping faster than a thermometer stuck below ground in the North Pole. Or jump on this epic opportunity and learn how to grow your wealth by AT LEAST 44%… EVERY SINGLE DAY. 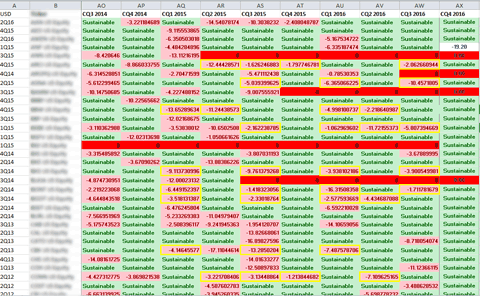 Since April 21, every carbon trade I’ve issued (but two) has gone up by double digits. SIX are now triples. 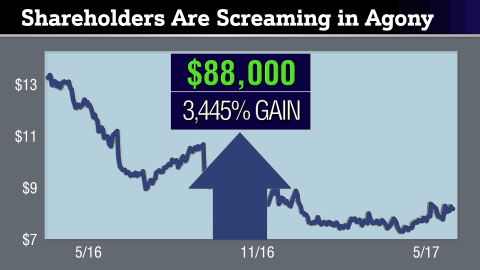 Together, they’ve generated 1,328% total gains in 30 trading days. What’s coming up will surely make you a believer, as I tell you how to make a quick $469,000. I’ve already shown you how one carbon trade can make you well over $100,000. And I’ve shown you that my TERMINATION calculations have never been wrong in identifying stocks that have a close to 100% chance of dropping in price. Back in December 2014, for example, my calculations would have told me that one of the largest stocks on Wall Street was on its way to the morgue. And had $9.9 million in interest payments. This is how I would have known the company had less than two quarters left to live out the rest of its miserable existence. And in August 2016, my calculations would have identified another DOOMED stock. This company was destined for destruction since day one. And had $4.3 million in interest payments. This company had 2.6 quarters left until it burned itself alive. But my obsession with bad stocks doesn’t just apply to one sector of the market. And are artificially inflated by Wall Street’s saboteurs. And there are more of them lining up all the time. And I’ve developed the unique ability of knowing how to generate AT LEAST 44% gains per day as they crash. How do I get in on a $469,000 payday? It’s centered on a company that sold $1.8 billion in goods last year, but only kept 0.4% of that money. If that isn’t bad enough, the company’s insiders can’t get rid of their shares fast enough. But I’ve pinpointed a single carbon trade that could make you $17,000. Another carbon trade involves a company whose been emptying their cash vault as if they were robbing themselves. In their latest press release, the company brags that their net sales grew 8% last year to a record $1.3 billion. But with one carbon trade, I can help you make up to $24,000 as this company becomes ancient history. 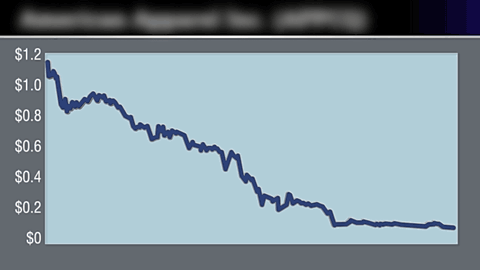 But I’ve found the exact carbon trades that could produce 6,620% in total profits as this stock enters oblivion. So you could sit back and watch a few $2,500 investments hand you a $168,000 windfall. And you know that when a company has so little faith in its own business, it’s time to call the morgue. But I’ve pinpointed a series of carbon trades that could make you about 2,220% from now until the company takes its last breath. That’s good for an extra $58,000 in your bank account. 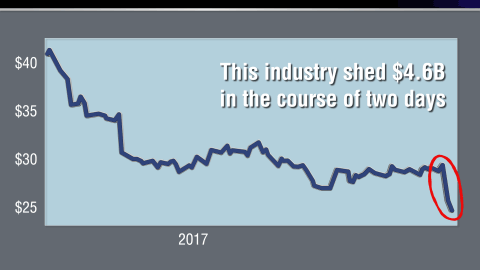 The fifth carbon trade I’ve found centers around a stock whose net income has gone from a POSITIVE $219 million to a NEGATIVE $286 million. That’s a 230% DROP. But your reward could be a 3,840% windfall. With four carbon trades, you could make $103,000 as the last of its shares are wiped out from existence. 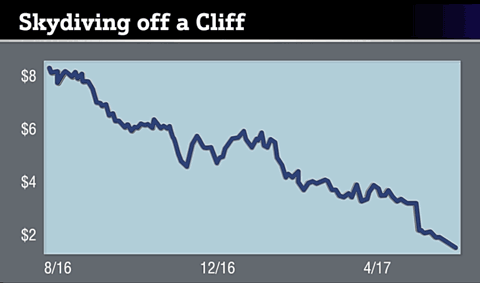 The sixth trade I have coming to you will allow you to profit from the demise of one of the most unprofitable stocks on the market today. In the last four years, they haven’t made a penny. But I can show you how to make a 2,188% return on your money! Enough to turn a few $2,500 carbon trades into $57,000 over the next few months. I’ve even found a way for you to carbon trade a company that basically sells cotton at a 1,600% markup. Over the last 12 months, their net income is DOWN an embarrassing 95%. They made an abysmal $1.3 million last year, barely enough to keep the lights on. 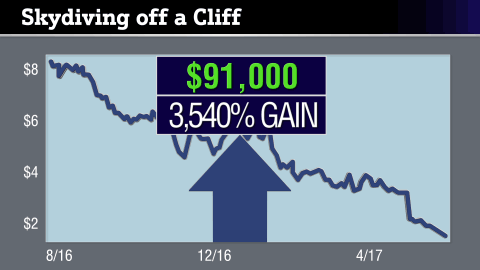 But I can help you make 2,660% gains as this company takes its final plunge… giving you the chance to turn $2,500 into $69,000. And with new carbon trades coming out every week, this is only a sample of what’s to come. And 2,057 with NEGATIVE ROI. I believe these companies are all bound for damnation. It’s simple to make millions of dollars from these awful businesses. But I’m only sharing my carbon trade recommendations with members of my Zenith Trading Circle. And although we have different backgrounds, we share a core set of values. We’re focused on preserving our integrity. We don’t flaunt our wealth or brag. We don’t have to tell anyone how we make money… unless we choose to. We believe in spending our money wisely. And we don’t let other – less knowledgeable people – influence where we invest. And we take advantage of opportunities when they’re presented to us. In this case, today, by targeting the WORST stocks in America – companies we know have no future and will likely only work in our favor. What’s important to us is that we make no apologies to anyone. And above all else, my Zenith members take my word very seriously. I’ve earned their trust and they’ve earned mine. I am devoted to them for LIFE. Like I said, since April 21, my win rate with carbon trades is 95%. The reality that far more stocks wind up in the gutter than not. The odds are heavily stacked in you favor. That my way of making money is delivering 44% GAINS PER DAY right now. Just decisive action on your part. 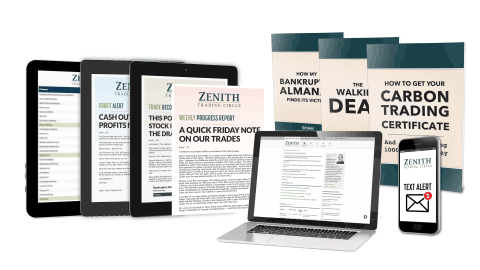 Every week, you’ll get an exclusive Zenith Research Dossier with details on a BAD stock, and the carbon trade designed to make you insane profits from its demise. You’ll see all three of my TERMINATION calculations put to work. I’ll tell you what the company’s liquidity factor is… so you can see how much money they don’t have in the bank. I’ll show you what its burn rate is so you can see just how quickly the company is spending its cash. I’ll also reveal its termination date so you can see how much time this company has left before it ticks its last tock. I’ll spill its DIRTY LAUNDRY in plain sight. I’ll tell you about any botched business deals, crippling expansion efforts, debt offerings, desperate spinoffs, unusual insider activity, trade violations, and any other details critical to our trades. Whenever it’s time to pull the plug on one of these dying businesses, I’ll also send you a Zenith Profit Alert so you can take action immediately. You will get “straight-to-the-point” instructions that tell you how to quickly close out the carbon trade and collect your cash. You can also elect to receive text message notifications to your phone whenever I release a Dossier or Profit Alert. That way you can get this information as fast as possible. These updates cover all of our current recommendations, so you’re always kept up to speed on where all of our positions stand. And I’ll also give you access to all my streamlined Zenith research reports that delve into a particular aspect of our investing methodology. Zenith is an elite enterprise. Which means it is impossible for me to open this up to everyone. That’s why, for now, I’m limiting Zenith Membership to 500 people today. And potentially DOUBLE THOSE GAINS within the next few weeks. But I can’t do that if too many people get into these trades. In fact, I don’t want to allow a single additional person into this research service. It’s the DISCIPLINE we need to remain successful. It is absolutely critical that every Zenith member who wants to get into these carbon trades can do so at the LOWEST possible price. This way they can also capture the highest possible payout when the time comes. So discretion is of the utmost importance. Again, there are seven carbon trades right now that are set to explode… and make you $469,000. Once you become a Zenith member, I’ll send all of them to you. 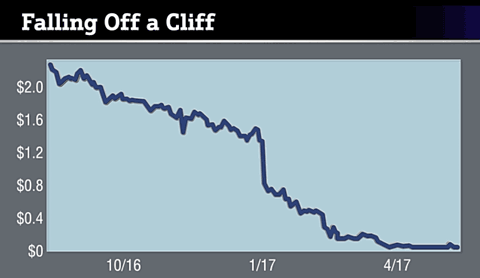 One is centered on a stock that is so bad that not only do they barely make any money, but their website traffic has even dropped 38%. 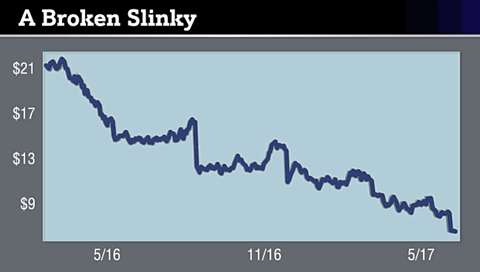 Another involves a company that has a one-star rating on Consumer Affairs and has seen their net income fall by 50% since 2014. A third trade revolves around a company that has virtually no cash to its name and is losing hundreds of millions of dollars every single year. And I’m going to show you how to carbon trade every single one of them for an expected payout of $469,000. If that isn’t BIG money to you, nothing is. The best hedge fund is delivering 4.9% gains PER DAY. But I’m helping my readers make 44% gains PER DAY, on average. And I’m not charging astronomical amounts of money like hedge funds do. About 1/50th the price I should be charging for a Zenith membership. But again, I’m not doing this for me. This is all for you. However, with only 500 openings today, my gut tells me these slots will fill up in a matter of hours. Now it’s time for you to make a move. One that you only ever have to risk a small amount of money to execute. There is a button at the bottom of this page. 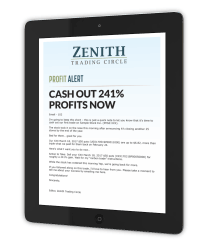 Click it and it will take you to a subscription form where I’ll reveal the price of my Zenith Trading Circle. With 44% gains per day… you’d be INSANE to say NO to this offer. And every day you wait is another potential 44% gain you’re missing out on. How many people are going to show you how to make $469,000 in the next few months? They wouldn’t know where to begin. 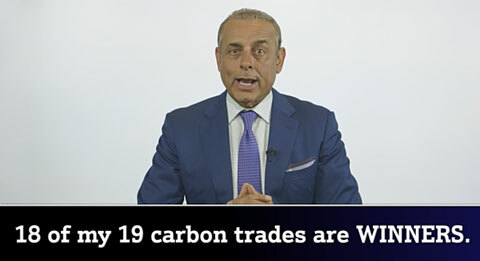 But I believe that with my carbon trades I can help you become a millionaire by year’s end. I’m so confident in this that at the end of the year I will be holding a private celebration for Zenith Trading Circle members in a luxury resort in Boca Raton, Florida. And we’ll be toasting to your success with caviar and vintage wines. And I’ll be there, standing right next to you. 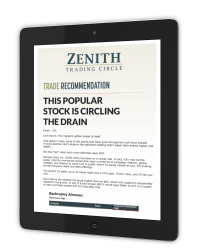 So click the link below, and become one of the 500 new members I’m accepting into Zenith Trading Circle today. Or call our staff at 1.855.509.6600 (1.443.353.4770 for international calls) and mention Priority Code: WZENT631. So you can tell me in person just how much money you’ve hopefully made from my carbon trades.